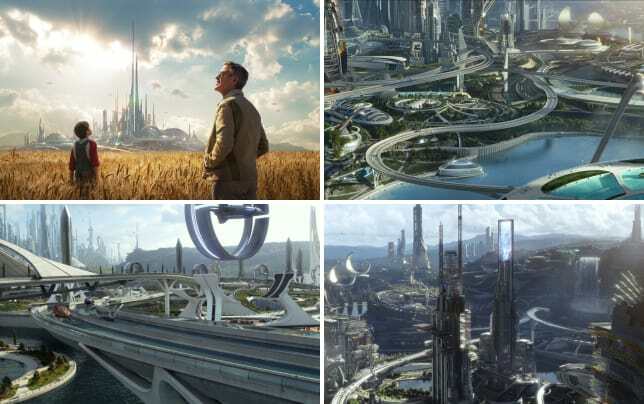 Tomorrowland may have started out as a dream of Walt Disney's, but the picture that hits screens this week is firmly from the creative minds of director Brad Bird and co-screenwriter Damon Lindelof. 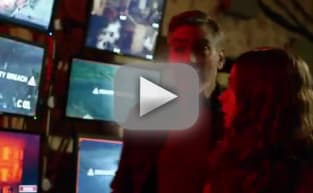 Disney’s Tomorrowland stars George Clooney as Frank, a former boy genius who has grown disenfranchised with a world that seems to be descending into a global warming-heated chaos with dwindling resources and a political structure too set in its ways to allow any kind of change. We first meet Frank as a kid attending the 1964 World’s Fair. He’s made a jet pack that (almost) works and as he saunters into the Inventors' Pavilion, he approaches judge Nix (Hugh Laurie). Nix sees something in Frank, but given that the jet pack doesn’t quite work, he sends him on his way. 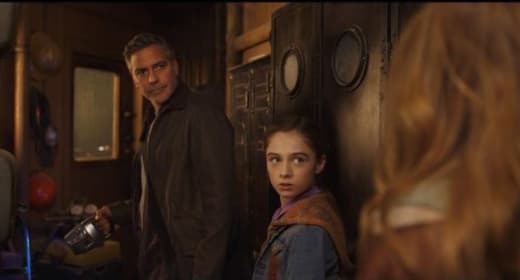 But, Nix’s tween acquaintance, Athena (Raffey Cassidy), goes a step further and gives Frank a “T” Tomorrowland pin that allows him to venture into a world that seems ripe with endless possibilities. Without giving away too much in our Tomorrowland review, let’s just say that Tomorrowland is a place where scientists and other great thinkers are free from political restraints to accomplish great things that will improve life for the masses. Through a series of events, Frank is exiled and we meet him again played by Clooney as a disgruntled (older) man. Meanwhile, Britt Robertson's Casey is living in Florida in the shadow of NASA’s greatness (her father -- played by Tim McGraw -- is an engineer there). We sense that she has more to offer the world than the boring riff-raff of high school and she too is given a Tomorrowland pin by Athena which eventually leads her to Clooney. Bird, after the success of Mission Impossible: Ghost Protocol, certainly knows how to build a suspenseful, thrill ride of a film. His background as an animated director with The Incredibles and Up firmly has him comfortable in the fantastical world that makes this a pure Disney family film. After his work on Lost, Lindelof is quite adept at creating worlds that keep you guessing around every corner which always leaves you with asking more questions than getting answers to previous ones. 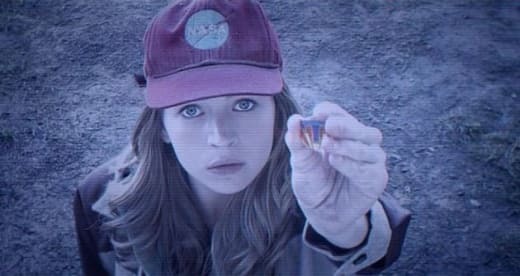 What they have done with Tomorrowland is create a world that spurs plenty of inquiry and gives the audience loads to think about in terms of our real world problems. Yet it does not fully live up to its promise. The final act of the film seems to work more as a landscape for Frank to deliver a monologue that reminds us of Clooney stepping in front of the UN. That’s not a bad thing -- they are all points that the world needs to hear. It is just that Tomorrowland is full of high-tech wizardry and loads of science fiction, jaw-dropping eye candy which in the end left us feeling a bit empty, where going in we had the highest hopes of exiting the theater moved and in awe.